A handy open source library designed for iOS developers, testers, and everyone interested in mobile app development. TouchZ optimizes time and efforts spent on testing and help app developers to get a better insight of how bugs occur. Our library is available for free and under the GPL license. Cannot go to bed without checking the latest news on twitter or connecting with some friends through messenger or maybe raiding a new village in Clash of Clans? We have all that experience only due to the existence of mobile phones and what’s more important phone applications. But have you ever thought what it takes to release a new app and how much time is spent on the elimination of all possible bugs (doesn’t sound very realistic, right?). It’s a well-known fact that world class mobile app developers put much effort into the process of testing their products. The facilities involved could be enormous. Just think about it: 15-20 testers working with one app using one type of device and the amount of different kinds of devices absorbed into the testing process could reach up to 50! The strong side of our TouchZ library is that it uses visualization approach. The bugs indicated or those that were failed to be indicated all could be saved in the forms of screenshots, showing what actually was happening on the screen of the gadget while this app had been tested. 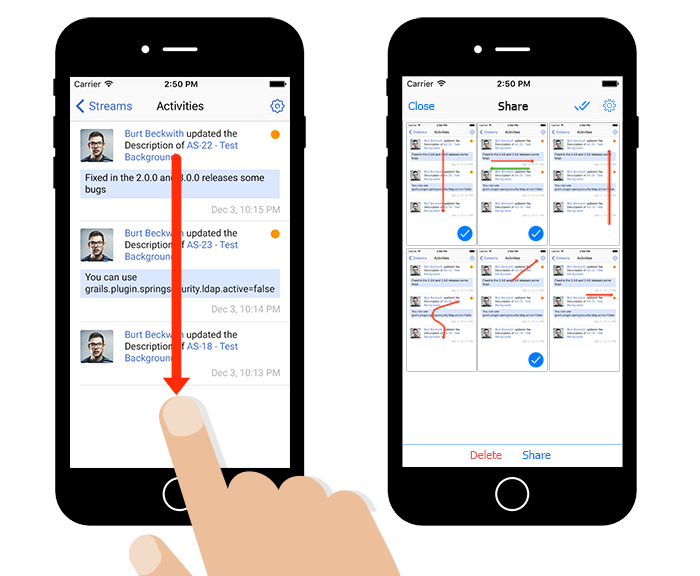 TouchZ is developed to be integrated into your iOS project and is ready to use. If the app is active and being tested, it evokes screenshots being taken automatically. This feature is on by any activity on the sensor screen of the gadget. It’s also easy to get access to the archive or TouchZ settings. Simply draw Z on the screen. sharing or export the archive with the shots to other programs. Pick the needed shots up and press ‘Share’. Screenshots have additional information on the date when they were taken. Screenshots show your tap activity. There is an arrow showing the gesture performed. Add line ‘pod ’TouchZ’ to Podfile in your project. Replace principalClassName argument (nil by default) with @‘TZApplication’ in main.m file of the project. This library is provided “AS IS” under the terms of the GPL. It requires iOS 8.0 or higher. This library is provided “AS IS” under the terms of the GPL. It requires iOS 8.0 or higher.